Water contamination is one of the most persistent problems of public health. Resistance of some pathogens to conventional disinfectants can require the combination of multiple disinfectants or increased disinfectant doses, which may produce harmful byproducts. Here, we describe an efficient method for disinfecting Escherichia coli and removing the bacteria from contaminated water using water self-propelled Janus microbots decorated with silver nanoparticles (AgNPs). The structure of a spherical Janus microbot consists of a magnesium (Mg) microparticle as a template that also functions as propulsion source by producing hydrogen bubbles when in contact with water, an inner iron (Fe) magnetic layer for their remote guidance and collection, and an outer AgNP-coated gold (Au) layer for bacterial adhesion and improving bactericidal properties. The active motion of microbots increases the chances of the contact of AgNPs on the microbot surface with bacteria, which provokes the selective Ag+ release in their cytoplasm, and the microbot self-propulsion increases the diffusion of the released Ag+ ions. In addition, the AgNP-coated Au cap of the microbots has a dual capability of capturing bacteria and then killing them. Thus, we have demonstrated that AgNP-coated Janus microbots are capable of efficiently killing more than 80% of E. coli compared with colloidal AgNPs that killed only less than 35% of E. coli in contaminated water solutions in 15 min. 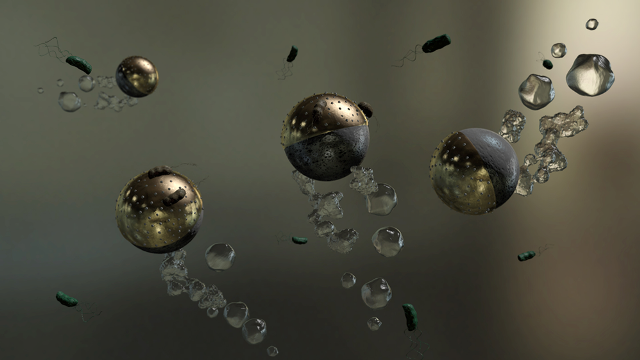 After capture and extermination of bacteria, magnetic properties of the cap allow collection of microbots from water along with the captured dead bacteria, leaving water with no biological contaminants. The presented biocompatible Janus microbots offer an encouraging method for rapid disinfection of water.